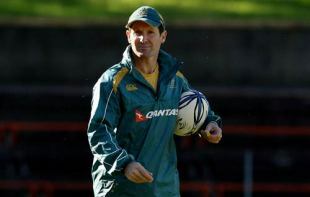 Robbie Deans believes that the criticism aimed at the All Blacks in recent weeks is a disadvantage to his Wallabies ahead of their Test in Wellington. Deans has named an unchanged XV for the final Tri-Nations Test of the year and is hopeful of a first win on New Zealand soil for eight years. The All Blacks conceded the title with defeat to South Africa last weekend but have retained the Bledisloe Cup after twice seeing off the Wallabies. "That's the concern because they normally respond to that sort of criticism," Deans said. "We're just concerned about what we're doing. We're delighted to have taken a step in Brisbane, but clearly they're travelling better than us. We're still the chasing group. "They're taking a lot of criticism; they are an experienced combination so there's only one way they're going to respond to that." All Blacks boss Graham Henry has delayed the naming of his side, with Deans expecting to face a new-look centre combination of Isaia Toeava and Ma'a Nonu. The Wallabies are eager to get going and Deans is unsure for the reasons behind the wait. "Obviously they're contemplating something, whether that be injury or combinations or form, I don't know," he said. "We'll know shortly, then we'll get on with it." Confidence in the squad is at a high for the first time since their opening loss to the All Blacks on July 18 and Deans' young players are growing in to the international game. James O'Connor, Will Genia and David Pocock have all impressed in recent weeks. Wing Lachie Turner believes that there are a few people beginning to take note of their new-found belief. "There's plenty of confidence. All along the squad's felt we're really building towards something and last week we found where we're going," he said. "We showed a lot of people what we're capable of. Going into this game we've got a great opportunity to build on that and continue showing people how good we are and where we want to be."